Rudy wanted it. He wanted it bad enough. The 1993 American sports film directed by David Anspaugh is the true story of Daniel “Rudy” Ruettiger who harbored dreams of playing football at the University of Notre Dame despite significant obstacles. Because he wanted it bad enough, he overcame all obstacles in front of him and beat all the odds against him. 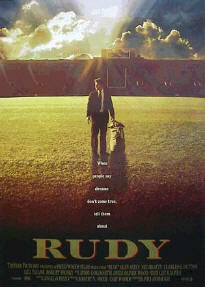 Rudy is one of the best 25 sports movies of all time; watch it again for the first time. How bad do we want it? Sometimes, not bad enough. Sometimes, we’re not sober; sometimes, we’re not vigilant; sometimes, we don’t press toward the mark like we should. We don’t always hunger and thirst for righteousness as we should. Simply put, we don’t want it bad enough. So what is “it” that we should want? First let’s get one thing straight: “it” is not things: silver and gold; fame and fortune; houses and lands. To their shame, the church of Laodicea wanted things. Jesus chided this church with these words: “You say, ‘I am rich; I have acquired wealth and do not need a thing.’ But you do not realize that you are wretched, pitiful, poor, blind and naked” (Revelation 3:17-18, NIV). We like this “lukewarm” church have replaced the gifts with the Giver; we want the goodies more than we want God. We want big cars and big houses and big churches; we want to be part of the “in” crowd that is in the “inner circle” of the church elite. This is not it. Than to be the king of a vast domain And be held in sin’s dread sway; I’d rather have Jesus than anything This world affords today. So, how bad do you want it? How bad do you want to be like Jesus? When we put God first, others second and ourselves last, we will receive the precious promises of Heaven; we are guaranteed to receive His presence and His protection and his power. I want Jesus, how about you? < Previous What’s Your Game Plan?